Yesterday we had an incredible day exploring Loch Rannoch and Rannoch Moor. It’s a place we have been meaning to visit for a while and all I can say is WOW! What an absolutely stunning, breathtaking area! 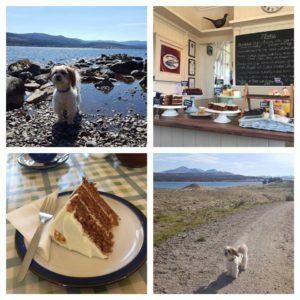 There are lots of places around Loch Rannoch that you can pull up with the car, stop and enjoy the views. If your dog is like our Baxter and enjoys a paddle then there are perfect areas for them to enjoy the water and some sections have small sandy beaches. The weather yesterday was just perfect so we spent a lot of time relaxing by the Loch. Late afternoon we headed over to Rannoch Station Tearoom which is hands down the nicest tea room we have visited with Baxter. We were greeted with a huge smile and Baxter immediately was offered his favourite of gravy bones which went down a treat! We ordered soup a toastie and a pot of tea. The food was extremely yummy and the soup was the largest bowl I’ve ever seen and filled us up after a days exploring. We were also sat right in front of all the homemade cakes made by the lovely Jenny and were completely spoiled for choice. Laurie opted for the carrot cake which was demolished in no time! I bought some tablet and I wish I bought more home with me as it was so good! Afterwards we ventured out onto Rannoch Moor and again the views were just incredible. We just had a day trip to Rannoch but you could easily have a wee holiday in the area especially if you like walking or cycling. You can walk to Glencoe from Rannoch Station which I think would be a fantastic thing to do with your dog. 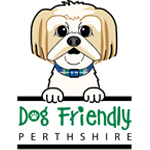 There is Dog Friendly accommodation in the area too with Moor of Rannoch, Liarn Farm Holiday Cottages and Bridge of Gaur Guesthouse all welcoming dogs. Every part of yesterday was just incredible. It’s one of these places you need to see with your own eyes and experience. I highly recommended a visit to the area and make sure to visit the Tearoom! We will definitely be visiting again.